The Estrella Mountain Dog takes its name from the Serra da Estrella, a mountain range in mid Portugal. Because of its remote location, it is impossible to determine the origin of the breed, but it is believed to be one of the oldest breeds of the Iberian Peninsula. In the summer, shepherds moved the sheep up to the high mountain pastures where the Estrella Mountain Dog guarded the flocks. In the winter, when sheep were moved to the foot of the mountains, these same dogs guarded the shepherd’s households and occasionally served as draft animals. During the 1930s, Portugal underwent a revival of interest in their native breeds, and produced the first breed standard for the Estrella in 1933. The earliest dog as recorded by the American breed club was brought into the United States in 1998, although it is known that some were imported several years earlier. The Estrella Mountain Dog was recognized by United Kennel Club in 1996. The Estrella Mountain Dog is a large, powerful, athletic dog, strongly muscled with substantial bone. The body is short backed, and the head is in proportion to the size of the dog. The Estrella comes in two coat varieties and coat colors include shades of fawn, wolf gray and yellow, with or without brindling, white markings, shadings of black throughout the coat or a dark facial mask. Estrellas have uncropped, small, triangular rose ears. The thick tail hangs down when at rest and should have a natural “hook” resembling a scimitar. The Estrella Mountain Dog should be evaluated as a working livestock guardian capable of protecting stock in mountainous terrain, and exaggerations or faults should be penalized in proportion to how much they interfere with the dog’s ability to work. The Estrella Mountain Dog is a faithful watchdog of the herds he protects, and a formidable opponent for any predator. This breed is intelligent but independent; loyal and affectionate to owners but indifferent to others; calm but fearless, and quick to react to danger. The Estrella Mountain Dog is a wonderful guardian of property and home, and can also be trained as a draft dog. The Estrella head is strong, big, long and slightly convex. It is in proportion to the size of the dog. Viewed from the side, the skull and muzzle are of equal length, and joined by a stop that is not very marked. The skin on the skull and cheeks is smooth. Faults: Head too long, narrow or pointed. The skull is well-developed and slightly arched in profile. The supraorbital ridges are only slightly developed and the occiput may be evident. Faults: Skull too flat or narrow. Long, tapering towards the tip, but not pointed. Almost straight, but very slightly convex at the tip (aquiline nose). Lips are large and tight, not thick or pendant, and without flews. Mucous membranes of mouth and palate and rims of the lips are preferably intensely black pigmented. Faults: Snipey or pointed muzzle, over-developed flews. The Estrella Mountain Dog has a complete set of evenly spaced, white teeth meeting in a scissors bite. An even bite is acceptable. Nostrils straight, wide and well open. Always darker than the coat, preferably black. Faults: incomplete or absence of pigmentation. Eyes are oval, medium size and set level, preferably dark amber in color. Eye rims are tight and preferably black. Eyebrows slightly marked. Expression is keen and calm. Faults: Wall eyes, eyes different in size. Ears are rose, moderately high set, and small for the size of the dog (about 4 3/8 inches in length and 4 7/8 inches width), thin, triangular, rounded at the tip; and carried falling backwards against the side of the head, with a small portion of the inner edge showing. Faults: Incorrect set on; ears too big, too fleshy or too round. Straight, short and thick; well set into shoulders; with a modest tuft of hair under the throat. The shoulder blades are long and wide, and form a moderately open angle with the upper arm, allowing for easy movement. The forelegs are straight and vertical, with round, sturdy bone and strong, broad, slightly sloping pasterns. 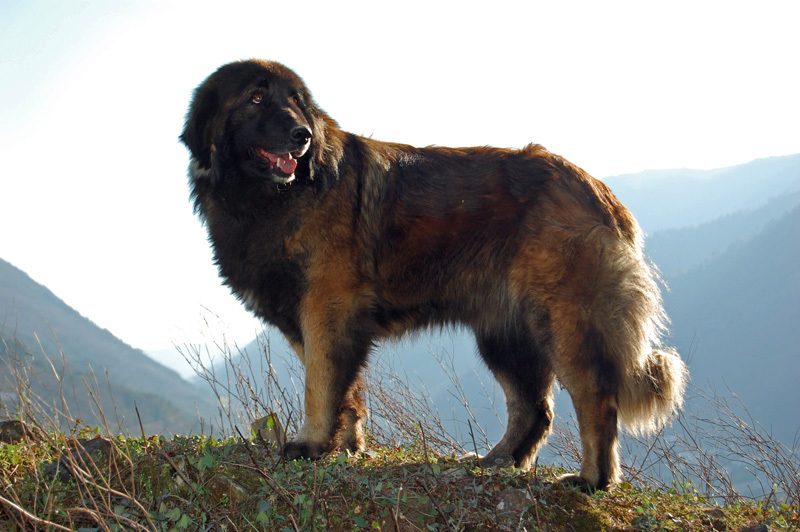 A properly proportioned Estrella Mountain Dog is slightly longer than tall, with a compact body and a short back. The chest is wide, well-rounded and deep, but not barrel shaped. The back is short, strong and nearly level from the withers to the slightly sloping croup. The loin is short, wide, muscular, and deep. The underline rises gradually from the sternum to the groin. The hindquarters are muscular and wide. The rear angulation is in balance with the front angulation. When the dog is standing, the broad rear pasterns are slightly let down, perpendicular to the ground and, viewed from the rear, parallel to one another. Feet are in proportion to the size of the dog, oval in shape with thick, well-closed toes. Pads are thick and hard, with abundant hair between them. Nails are dark, preferably black. Rear legs may have single or double dewclaws, or dewclaws may be removed. The tail is thick and muscular at the base, and tapers to the tip, ending in a hook. A tail of the correct length extends at least to the hock. When the dog is relaxed, the tail hangs down naturally. When the dog is moving or alert, the tail can raise above the horizontal curving upwards, forwards, sideways or even downwards. The tail is well furnished with hair and in the long-haired variety, the tail is well feathered. Faults: Docked, rudimentary, congenitally absent. The Estrella Mountain Dog comes in two coat types. Both types should have coat resembling the texture of goat hair. The thick, slightly coarse outer coat lies close over the body and may be flat or slightly waved, but never curly. Undercoat is very dense and normally lighter in color than the outer coat. The hair on the front sides of the legs and the head is short and smooth. Hair on the ears diminishes in length from the base of the ears to the tips. The hair on the neck, the buttocks, the tail, and the back side of the legs is longer resulting in a ruff at the neck, breeches on the buttocks and backs of the legs, and feathering on the tail. The outer coat is short, thick, and slightly coarse, with a shorter dense undercoat. Any feathering should be in proportion. Fault (both coat types): Coat texture too harsh or too soft. Fawn, wolf gray and yellow, with or without brindling, white markings or shadings of black throughout the coat. All colors have a dark facial mask, preferably black. Blue coloration is very undesirable. Desirable height for mature males is 25½-28½ inches; and for mature females is 24½-26½ inches. Mature males in good working condition weigh between 88 and 110 pounds. Mature females in good working condition weigh between 66 and 88 pounds. Faults: More than 1½ inches in height above or below approved range. Movement is free and easy. Dogs should not be penalized for carrying the head level with the topline in motion.